What a wise thing to have a koi pond at the entrance to a restaurant notoriously overbooked, yet well worth hoping for a table! We who wait outside Nancy’s Airfield Cafe become a small community. We count fish, compare notes. We point out hiding places. We announce our favorite colors and speculate on why some of us prefer the yellow, and none the white. 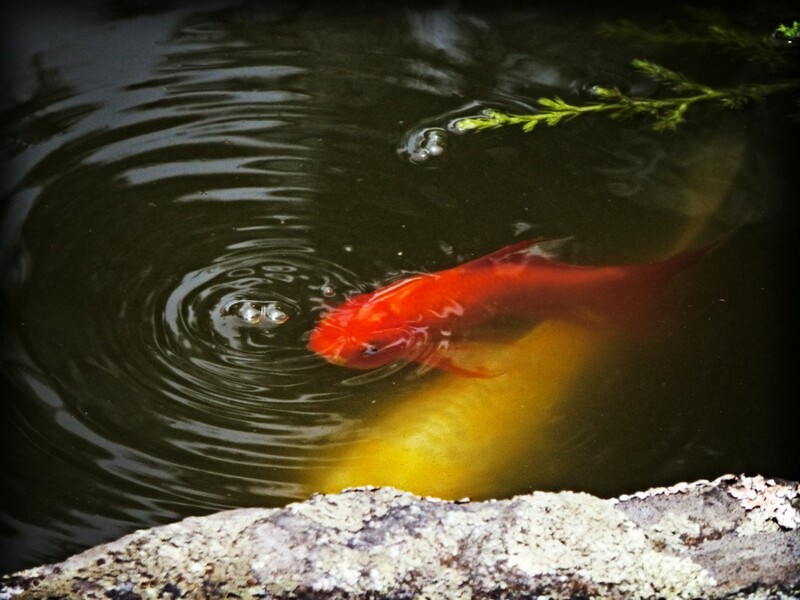 Koi are the cats of the water world. People who love them wish for more. Each has its own personality, coloring, favorite place to hang out. Koi tease and play with each other. Koi know when food is imminent. Koi like to mess with us a little. Mesmerized by the easy rhythm of the fish diving, rising for air and food, diving again, we relax. Enveloped in the scent of sage and thyme from the nearby herb garden, warmed by the sun and camaraderie, we forget why we’ve come. Too soon, our table is ready and we say good-bye. Even though we know it is fabulous, none of us orders the fish.